The state of New York, where the Second Amendment means nothing and its judiciary system is so liberal and corrupt it must make law enforcement officers purely frustrated. 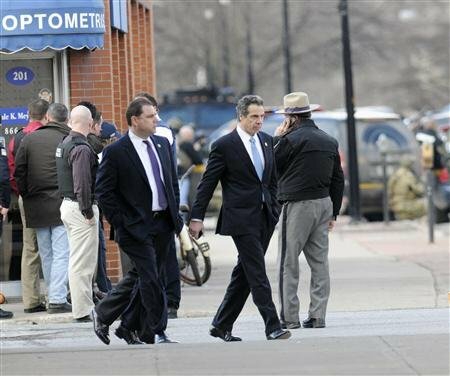 Its governor, Andrew Cuomo [history of big government politics] whose photo at the left looks more like a mob leader rather than governor of a state pushes for more oppression against citizens defending themselves. In the Reuters photo [left], he personally involves himself in a recent four-person murder. When searching the murder suspects apartment they found a cache of guns and ammunitions, a perfect photo-op and media event to reinforce his draconian anti-Second Amendment laws. Because of an incident in another state [Connecticut] whose firearm laws prohibit Second Amendment rights, which afforded Adam Lanza to kill children, and faculty at a Sandy Hook school with no effective resistance, it provided yet another excuse to take away rights of lawful citizens to defend themselves without repercussion from anti-constitutionalists. All mass shooters have chosen “Gun Free Zones” [legislation that should be delegated to state governments] to commit their insane acts, in a movie theater, shopping mall, or and public schools. People like governor Cuomo just do not get it. His new law expands the already oppressive assault upon firearms by banning weapons on the Feinstein bill that proposes to ban 158 firearms and limiting ammunition capacity of firearms. In addition, because of corruption and coercion – a person could be wrongfully accused of being mentally ill. It also mandates a life sentence without parole (not death sentence) for anyone who murders a first responder. If someone in your family is murdered, this sentence is not applicable. The incident occurred in a sleepy town of 2,700 people. Elected leadership in all levels of government attempt to legislate everything and it will create a utopia. Indeed, the US federal government is so full of itself; it has been tackling the job of legislating away climate change, blaming it upon human activity. The warming is not global and it is sporadic as well as part of Earth’s changing climate history that is older than human presence. Government is busy at interfering with individual lives, yet they do not provide oversight to prevent abuse within its bureaucracy. The populace is conditioned, coerced, and indoctrinated by corporate media that, like trade unions, provide government its increasingly unlimited powers. This entry was posted in 2nd Amendment, Bill of Rights, Crime, New York, Video and tagged 2nd Amendment, Crime, New York.